The details below are password protected and hidden – you can ask us for the password by using the Contact us form. All the very best – we have hidden it because it has contact details of senior devotees and we do not want the numbers and emails to be shown to everyone – spam callers etc. marryadevotee.com for 10 days. This is a matrimonial function organized by ISKCON Nigdi. It may help many devotees if you post it. 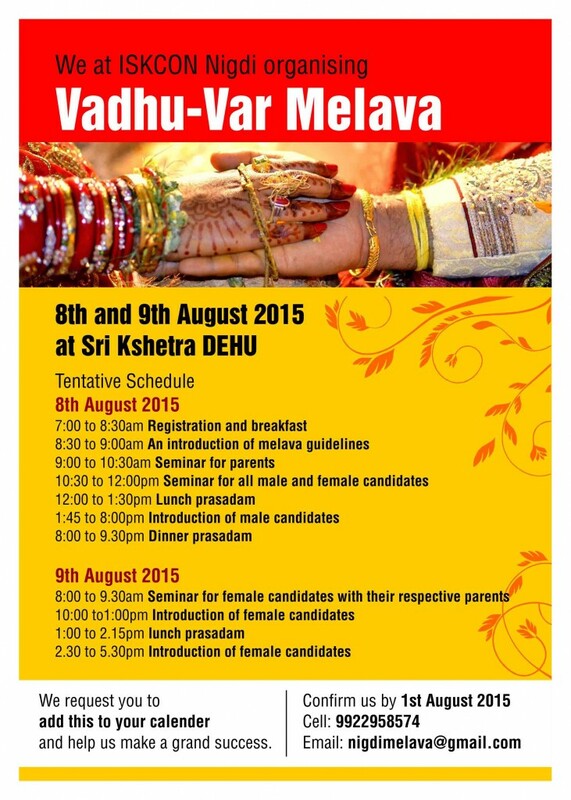 They will get an opportunity to participate in this and find a devotee life partner. Prabhuji there is a broucher attached with this mail. And below is some more information not mentioned in broucher. – According to your demand and facility available you have to pay for the accommodation. – Registration Charges Rs. 1000/- has to paid on the same day of event. – Only candidate + 2 guardian will be allowed in the hall. – Breakfast + lunch + dinner is included in registration charge.